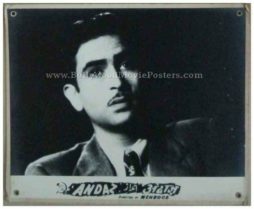 Old Bollywood movie still photo of the Raj Kapoor cult classic, Shree 420 (1955) for sale. 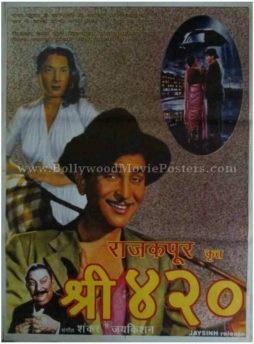 This is an actual surviving old Bollywood lobby card of the Hindi film Shree 420 (translated as Mr. 420 and sometimes also spelled as Shri 420). 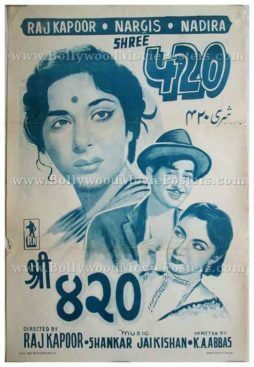 Shree 420 is a 1955 Bollywood classic directed and produced by the Showman of Indian cinema Raj Kapoor, featuring him in a leading role opposite Nargis. 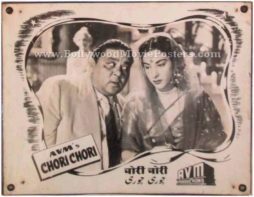 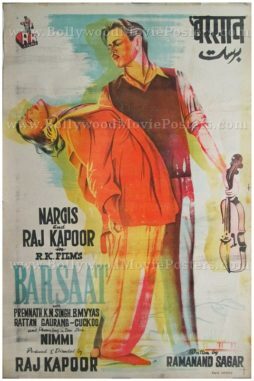 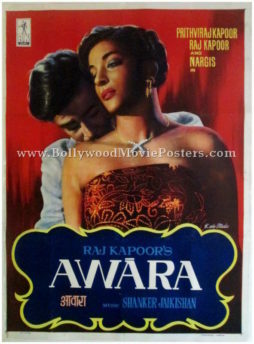 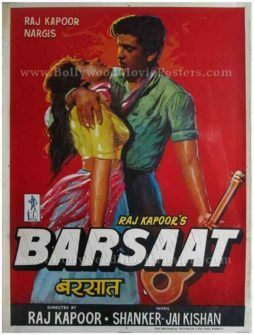 Printed and circulated somewhere in the 1950s, this old Bollywood lobby card was designed and printed for publicity of the film inside theaters. 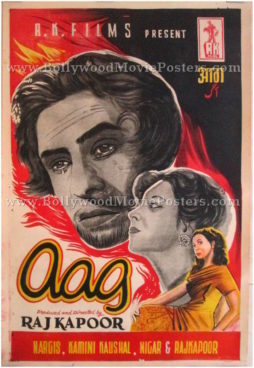 This beautiful vintage Bollywood movie lobby card was actually used inside a theater that screened Shree 420. 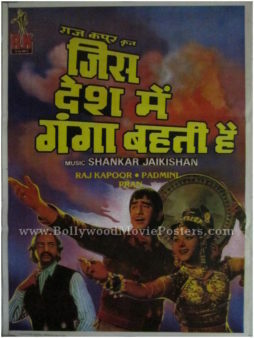 The four corners of the lobby card feature punched holes and display tell tale sings of being pinned on the notice board of a movie theater. 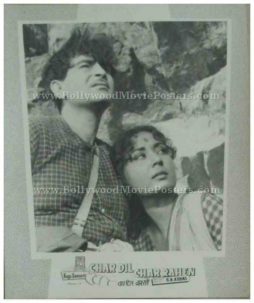 The “Pyar hua ikrar hua” image depicting Raj Kapoor and Nargis singing and dancing under a shared umbrella in pouring rain is regarded as one of the most iconic images in Bollywood, making this old Bollywood still photo highly collectible! 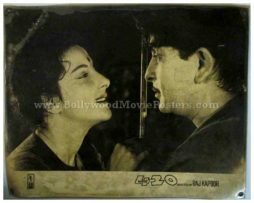 An iconic scene from Shree 420 depicting Raj Kapoor and Nargis holding an umbrella on a rainy night, singing the blockbuster hit song, “Pyar hua ikrar hua” is seen in this old Bollywood movie still. 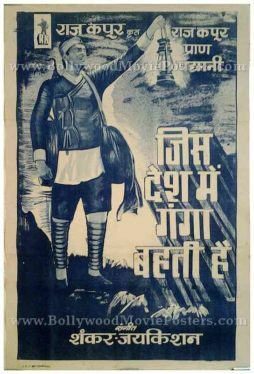 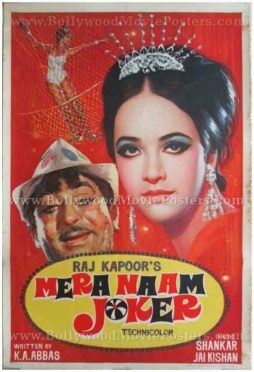 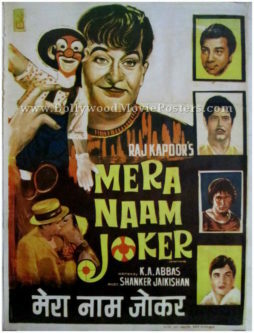 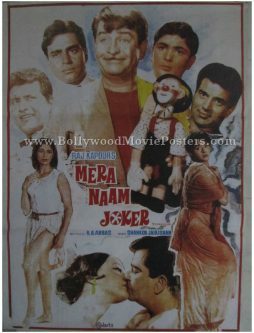 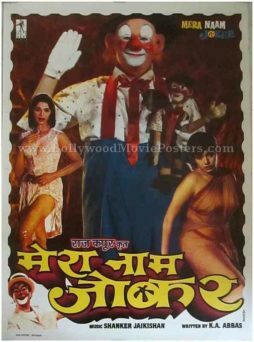 Original vintage Raj Kapoor movie poster of the memorable Bollywood film, Main Nashe Mein Hoon (1959) for sale. 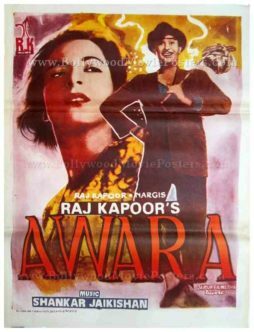 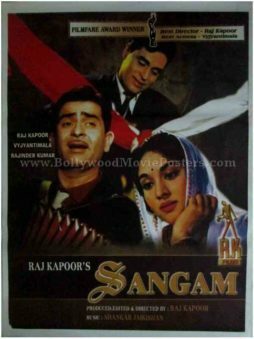 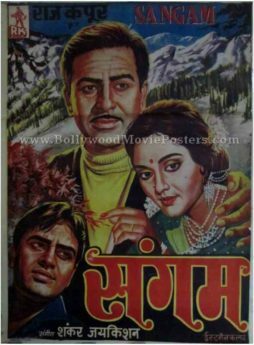 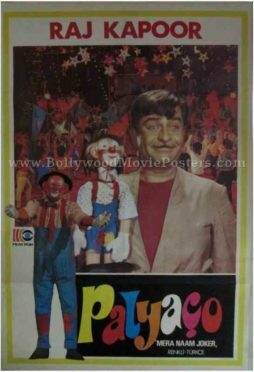 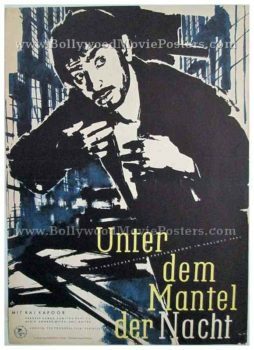 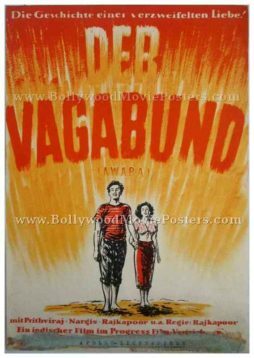 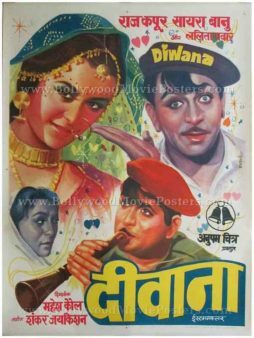 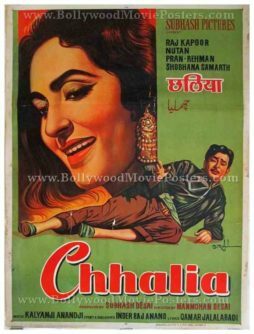 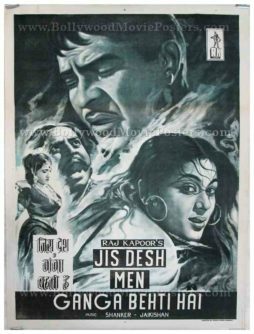 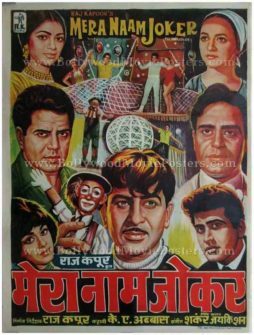 This is an original Bollywood poster of the 1959 Hindi film that featured the showman of Indian cinema, Raj Kapoor in the lead role along with Mala Sinha. 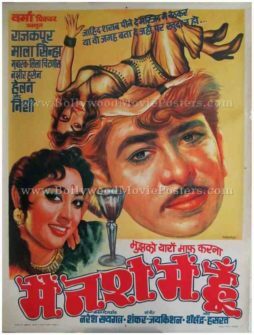 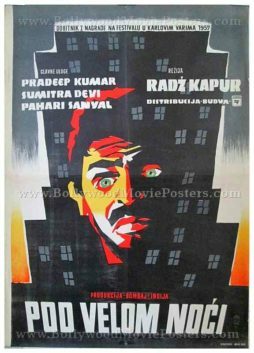 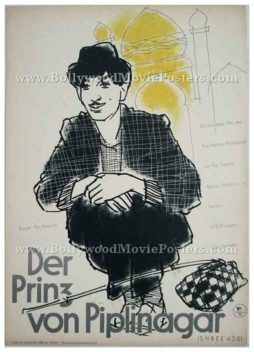 Printed and circulated during the first release of the film (Late 1950s), this rare Raj Kapoor movie poster was originally designed for publicity of the film but never ended up being used.